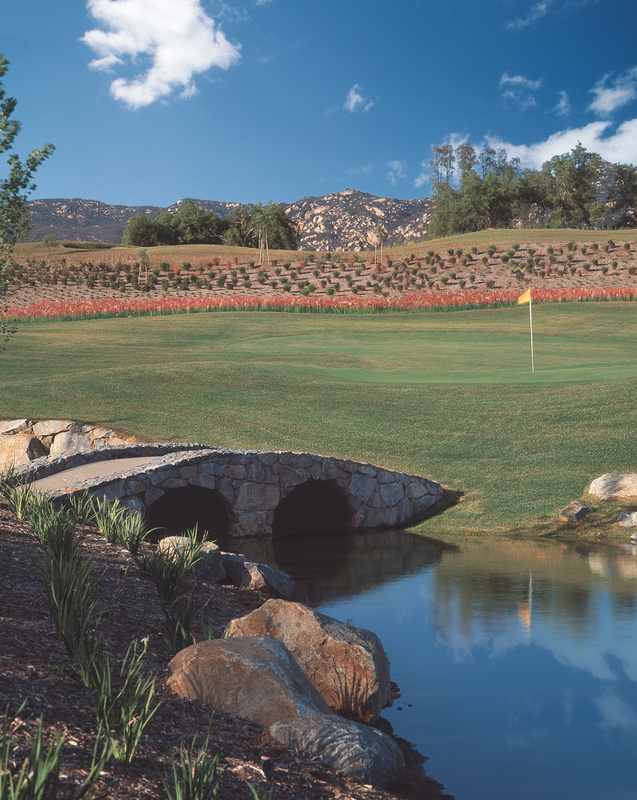 If you haven’t yet discovered Reidy Creek, an executive course at the base of the Escondido Mountains, you might be surprised at what you find. It’s easy to say this isn’t what you’d expect from an executive course. It’s another thing to show you. Take the third hole. It plays to 167 yards nearly dead uphill with two deep sand traps guarding the right side. There’s room short and left, but long is OB. The green is double-tiered, not counting the false front. It took a healthy 6-iron for me to find the back fringe. It’s no stretch to envision this being a par-3 on the course you play regularly. And that’s what Reidy largely feels like – a real golf course at an reduced yardage (2,582). It’s more like a second-shot course, if you will, because the greens are what you’d expect to find at the end of a regulation par-4 or -5. Take that level of play and put it without terrain that winds through the wilderness of a wooded area (trees, streams, wildlife, etc.) and you’ve got an uncommon executive golf experience. Note: If you aren’t hitting it reasonably straight, you will lose balls here. I played Reidy for the third time last week, first in a while, and was glad to be reminded of its merits. I came away with at least five things I really like about this course. Sophisticated greens – The normal association you get for greens at an executive course is small and mostly flat. Not here. Every green at Reidy is undulating and some are quite large (there’s a double green on back nine) meaning they can host multiple pin positions and really change how the course can play. Some pin positions can be quite tough. For instance, I hit a shot to 6 feet early in round that ended up being a 15-foot putt. My ball landed on the wrong side of a ridge. And that’s part of what keeps this course challenging for advanced players. If you go pin-seeking every hole, I guarantee you’ll eventually have to hit a major recovery shot at some point. For me, it was a bunker shot from an awkward stance. The other benefit of these types of greens is that if you aren’t good at reading greens, this is an ideal place to learn. And the green speeds are kept at a pace that doesn’t penalize you terribly for your misses. To show you what kind of putts you can get, I was really wanting a birdie to get my card back to 1-over going into No. 18. That meant sinking a 12-footer on 17. The putt had 6 feet of break and I just missed, grazing the cup. Not a putt you normally find an executive course, but great practice for my next regulation round. You will earn your score here, trust me. Walkability/pace – My only reservation about walking here is simply a few long, but manageable, stretches between holes. But I saw people walking who told me they didn’t mind. The Reidy staff told me about a third of players walk or take a pull cart. Either way, playing in under three hours is certainly doable and a refreshing break from the plodding pace you find on some bigger courses. I zipped around in about 2:30, playing through about three groups in the early afternoon. It found my rhythm on the back and scored well. You can play fast here, or take time to teach, which I’ll get into in a few more paragraphs. Great condition – Save for some maintenance on the tee boxes this time, this course has been in peak shape each time I’ve played it. And the greens are tip top. You don’t have to worry about spotty greens or finding a course that’s rough around the edges here. You get the same quality you’d expect at every other JC course. Great couple’s course – It’s common to see couples here, and for good reason. It’s a course that can easily accommodate differing handicaps. From my own experience, I brought a former girlfriend here who was getting back into the game. She found the whites tees comfortable and the course quite playable. On the back nine, after a few near-misses, she finally bagged her first birdie on No. 16 and did a victory dance around the flagstick. That success came after a little coaching and a little practice, which the pace here allows for. Meanwhile, I was getting some solid practice in on my irons and my short game. The only possible drawback here is that you don’t get to hit driver, which I know some players like to do at least once or twice on an exec., but you don’t really miss it. The level of shot making required keeps it interesting enough. No. 18 – Try to think of a finishing hole at an executive course you’ve played. Can you? You’ll remember the 18th at Reidy Creek, partly because it gives you your first impression of the course. When you pass the pro shop, the first thing you see is the pond surrounding the 18th green and the stone walking bridge leading to it. It’s an eye-catcher and evokes a little Amen Corner association the first time you see it. Playing it is a challenge. It’s 164 yards to a deep green, which, again, is surrounded by water on the right and OB left. What’s more, factor in a slight crosswind. When I played it, I pushed a little too hard for birdie and yanked my tee shot OB. There’s a rather safe play available to the front of the green, but then you’ve got a lot of putt on your hands. I took double bogey and walked off in 3-over on the back. I’m coming back to par it. Hey, didn’t I say that last time? To book a round at Reidy Creek, call 760.740.2450 or book it here at jcgolf.com. This entry was tagged escondido, executive course, Golf, JC Golf, Reidy Creek. Bookmark the permalink.